Christians are routinely being beheaded in Lebanon by Sunni Muslim terrorists. President Obama is making a deal with the Shia Muslim government of Iran. Sunni Muslims are executing Shia Muslims in Africa. Sunni Muslim rebels are attacking the Shia Muslim government of President Assad in Syria. Egyptian Sunni Muslim terrorists (i.e. the Muslim Brotherhood) attack their own Sunni government in Egypt. Israel's Prime Minister Benjamin Netanyahu calls the Shia government of Iran "today's Nazis," and says the west is "comatose to the threat." Russia and China are aligning with Shia Iran and Shia Syria; the United States has historically aligned itself with Sunni Saudi Arabia and Sunni Egypt. Yet now, President Obama is making a treaty with Shia Iran over the objections of Israel. What's going on? How can you begin to understand current events without knowing the differences between Sunni and Shia Islam? Since the average American's attention span is shorter than most, I will summarize the five major differences between Sunni and Shia Islam, but urge those who wish to know more to read the article from the Council on Foreign Relations entitled The Sunni - Shia Divide. Never forget this fact: To be a Muslim is a matter of faith, not ethnicity. One can be born an Arab, or a Persian, or an African, or an American, or a Chinese - and become a Muslim, for Islam is a matter of faith, not race. A Muslim believes that "Islam is the only acceptable faith to God" and therefore, it will make the world a better place if everyone would "submit" to God and become a Muslim. Islam means "submission" in Arabic. There are five pillars of the Islamic faith. After acquiescing to the first pillar (see below), one is deemed to be a Muslim convert. Pillar One: Recite "There is no god but Allah, and Muhammad is His Prophet (or Messenger)." This statement is called the Shahada. Once you say this aloud--with conviction and understanding -- then you are declared to be a Muslim. Pillar Two: Pray "five times daily facing Mecca." This is the daily worship of a Muslim. Pillar Three: Give 2.5% of your wealth ("alms") to the poor and needy. Pillar Four: Fast during Ramadan, a religious festival that occurs during the ninth month of the Islamic calendar, a month which also goes by the name Ramadan. Since the Islamic calendar is lunar and eleven days shorter than the solar calendar - with no catch-up lunar months like in the Hebrew calendar - Ramadan migrates through the seasons (summer/fall/winter/spring) from year to year. Pillar Five: Go to Mecca (Saudi Arabia), the birthplace of Islam, on a personal pilgrimage at some point in your life. Worth remembering: Not all Muslims are terrorists. Terrorism is defined as "the use of violence and threats to intimidate or coerce, especially for political or religious purposes." An example of a Sunni Muslim leader who is not a terrorist is former army general and current Egyptian President Abdel Fattah al-Sisi. He recently called for a reformation within Islam to stamp out "violence and aggression." Sadly, our American President supported the Islamic Sunni terrorist group called the Muslim Brotherhood during the Arab spring of 2010 to 2012. Egyptian President Abdel Fattah ultimately executed the leaders of the Muslim Brotherhood for their violence against Egyptian Christians. Also worth remembering: Muslims who are terrorists believe they represent the true Islamic faith. These 'radical, fundamentalists' of the Islam faith believe that when they "take the sword" and kill infidels, they are fulfilling the will of Allah and are obedient to the Quran. The Sunni and Shia Islamic terrorists who are killing, maiming, subjugating, and ritualistically beheading "idolaters and infidels" are fighting a religious war against encroaching western corruption. Whether you believe "Islam is a peaceful religion" is not the issue; those who cut the throats of the idolaters and infidels believe they represent true Islam. For an Islamic fundamentalist terrorist his behavior is grounded in his faith. Now to the important subject of being able to identify the differences between Muslims who identify themselves as Shias and those who identify themselves as Sunnis. (1). LEADERSHIP - Sunni and Shiite terrorists differ on who should have succeeded Muhammad after his death in 632 AD and who should lead them now. After Muhammad died, some of his followers--later known as Sunnis--elected Abu Bakr to lead them. The Arabic word Sunni means "people of the tradition." Sunnis believe that Islamic leaders should be elected by the popular vote of the people because only the traditions of the Quaran and the prophets are important, not the leaders themselves. . However, some followers of Muhammad immediately objected to the election of Abu Bakr, believing that Islam should only have leaders (i.e. Prophets) who directly descend from the great prophet Muhammad himself. These followers -- later called Shias - followed the son-in-law of Muhammad, Ali ibn Abi Talib, and Ali's sons (that's why most Muslims named "Ali" are Shia Muslims). Shia is the Arabic word which means "follower." Most Shia Muslims believe that the 12th Prophet after Muhammad went into hiding in 939 AD, but will ultimately return at what they call "The Second Coming" when he will restore peace to a chaotic and destructive world. Until then, all authority and power has been invested in "ayatollahs" who are the chief clerics of true Islam (think Ayatollah Khomeini of Iran). Sunnis and Shias historically lived together and intermarried. 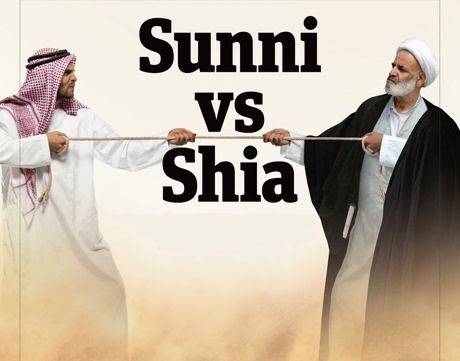 However, the friction and divide between Sunnis and Shias has escalated violence toward one another. A similar comparison would be the Catholic/Protestant wars in Ireland during the 1980's and 1990's. The newly declared Islamic State (IS or ISIS) is a Sunni group and its stated goals are to create a territory run by a caliph and sharia, or Islamic law. Shias do not believe that a true Islamic state or caliph can be created without a Prophet or ayatollah. So Shias reject ISIS. In return, ISIS warriors are rounding up and killing Shia Muslims in ISIS held territory. (2). NUMBERS - There are 1.6 billion Muslims in the world. 85 percent (1.3 billion) of these Muslims are Sunni. Only 250 million Muslims are Shia. The identity of Shia Muslims is rooted in victimization by the majority Sunnis. Only two countries--Iran and Iraq--have a majority Muslim population that is Shia. Though Syria is a majority-Sunni country, the regime of President Assad is a close ally of Shiite-dominated Iran. And though Iraq is majority Shia (also called Shiite) the northern portion of Iraq has a lot of Sunnis. The Islamic State of Iraq and Syria (ISIS) has made increasing inroads into Shia-dominated Iraq. Neighboring Iran is majority Shiite, while next-door Saudi Arabia is majority Sunni. Yemen, Bahrain, Afghanistan, Pakistan and Lebanon have significant Shiite minorities, but are majority Sunni. Turkey is a majority Sunni country. Sunni Muslim radio and television broadcasters in Arabic countries area now claiming President Obama's family of origin is Shia Muslim and this explains his empathy toward Iran. (3). TERRORISM - Sunni terrorists will fight their own governments. Since Sunnis believe in "elected leadership," they are always seeking the most qualified candidates to lead Muslims in the one true faith. If these radical Sunnis believe current government leaders are "unfaithful to the Prophet or the Quran" they will revolt from within. This is what happened in Egypt when the Sunni Muslim Brotherhood attacked the Sunni government in 2012, and it is what happened throughout the Arab spring in other Sunni-led countries. It's also why Sunni-led governments (like Egypt and Saudi Arabia) will fight against Sunni-led terrorism (like ISIS). ISIS wishes to disband all state governments and coalesce around a pure, Sharia-law state where Islam is practiced with purity and without the taint of western influence. On the other hand, Shia terrorists are typically government sponsored. For example, Shia Hezbollah-- the terrorist group stationed in southern Lebanon that has historically attacked Israel--is supported by Iran and Syria, two of the three governments led by Shia Muslims (the other government being Iraq). This is the reason why Israeli Prime Minister is so vocal against Iran. Iran sponsors state-run terrorism. Israel believes Iran is ever expanding its influence and power in the Middle East, and is now pulling Iraq into its sphere of influence, supporting Syria in its war against Sunni rebels, and is now trading oil with China and Russia. Israel believes Iran is the greater terrorist threat. However, now that Sunni ISIS is taking territory for itself in a bid for power--all the while beheading Christians and Shias, enslaving women and girls as sexual property of ISIS warriors, and recruiting Sunni Muslims from all over the world in its bid for a Muslim Caliphate that rules the world--one wonders if the pendulum has swung and the greater threat in this world is Sunni terrorism? It could be argued that the Muslim Middle East is about to explode in war with Shia-led Iran (backed by China and Russia) go to war against Sunni-led Saudi Arabia, Turkey and Egypt. Speaking as a pro-Israel supporter, I'm not nearly as convinced that Iran is the greater threat to western civilization as is the Sunni-led terrorism of ISIS, and I realize this opinion is in opposition to Israel Prime Minister's views. (4). PRACTICE - As radical Sunnis (ISIS) target and kill Shia (or Shiite) Muslims, the question must be asked "How can anyone tell the difference between a Shia and a Sunni?" Remember, there's nothing ethnic about being a Sunni or a Shia. It's a matter of faith. The answer to how to tell the difference between a Shia and Sunni in practice is four-fold: (a). Ask for their name. As mentioned earlier, Shias have names such as Ali (or Hussein, Assan, or Abbas). Cassius Clay changed his name to Muhammad Ali (b). Ask how they pray. Sunnis fold their hands or cross their arms on their stomachs while praying. Shias are taught to pray with palms resting up on their thighs. (c). Ask what music they enjoy. Just as Catholics and Protestants sing different songs, Shias and Sunnis sing and enjoy different music. (d). Ask where they live. Due to growing animosity, in Muslim countries, Shias live in enclaves (neighborhoods) where they can worship, shop, and work together. Similar to the divisions that occurred in Ireland during the Protestant/Catholic wars of the late 20th century. These are the fundamental differences between Shia Muslims and Sunni Muslims. The only way Sunni-led ISIS or Shia-led Iran will ever be stopped in their aggressive grab of land, power and people is for people to recognize that this is a religious war, and its not east versus west, but east versus east and the west better think long and hard before choosing a side. You are welcome Al. I'm glad it helps. I wrote it for a church member who was confused about Islam, and it's always encouraging to know that others benefited. and yet the King claims descent from the prophet Mohammed. Is this an exception to the rule? Or is Jordan a 'model' of a more civilized Islamic nation where Sunnis are able to call their country a 'Hashemite' kingdom (leadership descends directly from Mohammed) ? But we in the West are trying to learn more and I appreciate your attempts to sort out the complexities of the 'Sunni/Shia' puzzle. Often, Sunni Muslims will attempt to trace their lineage directly to the prophet Muhammad. For example, when ISIS declared itself a state (caliphate) in 2014 and appointed their new leader, Abu Bakr al-Baghdadi, they produced a video which announced that their leader (Abu Bakr al- Baghdadi) was a "descendant from the family of the Prophet, the slave of God"- many believe this is simply an attempt to appease Shia Muslims in order to unite the entire Muslim world against the west. So, to answer your question, periodically Sunni Muslims will CLAIM that they are the direct descendants of Muhammad. It's not true. All his line was eventually killed - and that's why Shias await the return of the 12th Prophet - the last Imam (descendant of Muhammad). It does help. Thanks, WADE. Clever title Wade! Shia Happens! Thanks for weighing in on this important topic. Counting all the years this has been going on, one might wonder why it hasn't been analyzed by the conventional media. Except not really. I had a brief conversation with a Muslim man who runs a cell phone accessory shop nearby. I asked him if all Muslims were told to kill all infidels. He immediately said "Oh no, that is up to God to judge people". I was encouraged. It still comes down to people and their souls and a God Who is bigger than the world, and Who is still in control. And in Whom we need to be on solid ground. Eternally. Thank you Wade for clarifying very important information regarding Muslims and their faith Islam. I leading my 3rd team to India in about 3 weeks and our primary focus is reaching Muslims. This is good preparation for our team. I have found the Muslims in India extremely open in sharing their faith and hearing about mine. Getting beyond the culture fear as lead by the Spirit is proving fruitful. Thanks again. I thought the US had already taken sides, backing Turkey, and the muslim Brotherhood in Egypt, arming, training and supplying Iraqis only to watch them inexplicably retreat leaving all their US arms behind for ISIS, shipping arms from Libya to Syria and calling for Assad's ouster. The US has armed or aided by one means or another, the Sunni rebels in Egypt, Libya, Syria and Iraq. The result will be ISIS deposing Assad, so that the Qatari natural gas pipeline can go through Syria and undercut Russia's sales of energy to (and the subsequent extortion of) Europe. Thank you for your effort. However much of what you have reported is very bias and misleading.. i urge any e who reads this to do your own research and validate information. Very bias.. Alot is true but alot isn't.